Preheat oven to 375 °F (190 degrees). Use a round 9-10 inch (24cm) silicone backing dish. If you use a tart pan or a glass pan dish it needs to be slightly greased. For the crust take ground flax seed and mix it with 3 tbs water in a small bowl to gel up for 5 minutes. Use a large bowl and mix the almond flour, oat flour, salt, herbs, water and coconut oil together with the flaxseed. The dough must be sticky between your fingers before you work it evenly into the baking dish. Poke a few fork holes in the dough so air can escape and bake it at until slightly gold on 375 °F (190 degrees) for 7 minutes and for 6 minutes on 350 °F (180 degrees). Take the crust out of the oven and prepare the filling while the crust cools down, set the oven temperature back to 390 °F (200 degrees). For the filling crumble both tofu blocks, almond milk, nutritional yeast,herbs salt and pepper into a bowl and use a hand mixer to create a smooth and creamy filling. Use a big skillet, add oil and saute the leek, onion and garlic over medium heat for about 5 minutes. Add the mushrooms and cook them for about 10 minutes until most of the water is gone. Add the sun-dried tomatoes and baby spinach and cook it until the spinach wilts. Mix the tofu and sauteed vegetables together in the bowl and adjust seasoning. Spread the mixture evenly on the pre baked crust. 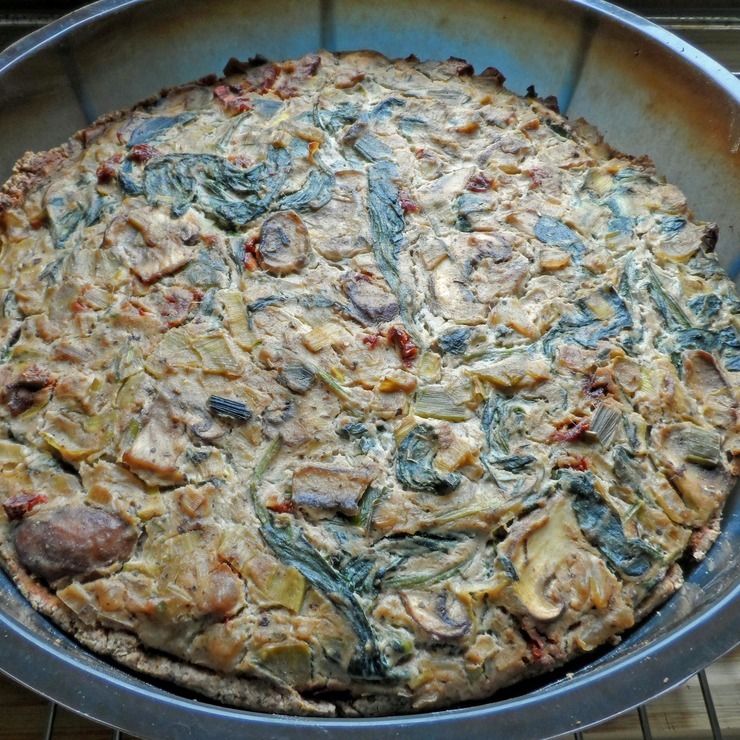 The quiche should cool down for 20 minutes before it can be sliced. 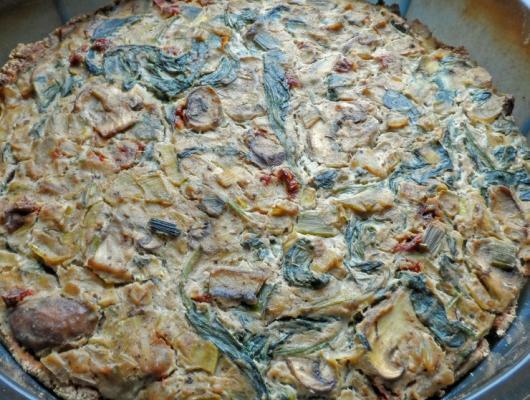 Easy vegan low carb gluten free quiche packed with spinach, mushrooms and a great smoky flavor.